Mineral insulated thermocouples are thermo wires compressed in fire resistant magnesium oxide which ensures a high pressure resistance. 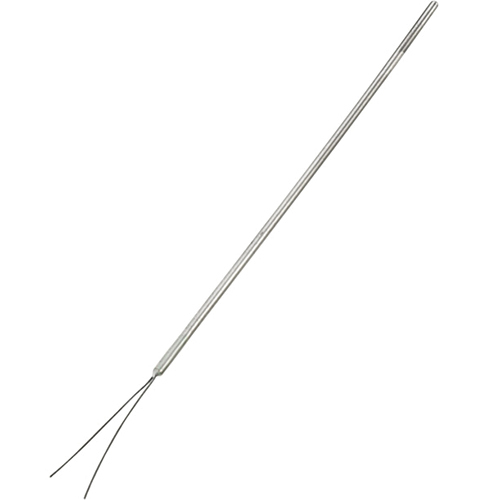 Thermocouples type K are suited for the range -200…+1100 °C. The shock resistant construction assures a long life span. The excellent heat transfer between sheath and thermocouple allows short response times and high measuring accuracy. The mineral insulated thermocouples are available with a diameter of 1,0 mm, 1,5 mm and 3,0 mm and can be supplied with either B+B miniature, or Standard thermocouple connectors, or with high-quality FEP silicon connection cable up to 180 °C with free ends. The thermocouples type K can be used for the temperature range up to 1335 °C. To ensure class 1 accuracy B+B only utilizes high quality thermo material for the production of thermocouples. B+B Thermo-Technik has been producing for over 30 years thermocouples of all conventional types: type K, type J, type S, type T, type N, type R and type E. Moreover B+B offers you as well a vast range of accessories in the field of thermocouples from thermo cable over thermo wire up to thermocouple connectors.